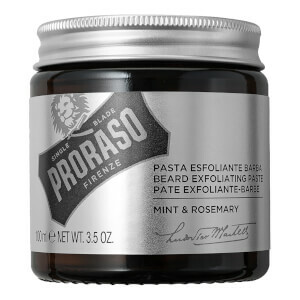 Make your beard the best it can be with Proraso Exfoliating Paste, a gentle but intensive cleanser that prepares facial hair for the shaving process. Enriched with the soothing, refreshing properties of Mint and Rosemary, the beard cleanser expertly lifts away dirt, impurities and dead skin cells right down to the roots. Sweet Almond Oil ensures beard hairs are conditioned and softened to improve razor glide and minimise nicks and cuts, while an invigorating fragrance of Eucalyptus lifts the senses. Apply a coin-sized amount to a damp beard and massage down to the roots. Rinse thoroughly with warm water afterwards.